If you've read the past few interviews posted on this site, you might have noticed a theme. For the past few days, I've introduced accomplished authors who have published a number of books. I've also introduced novels that are perfect for this time of the year. If you're looking for a special read for Halloween, or something to curl up with on a cold, windy night, you've come to the right place. Alexie Aaron is the author of cozy mysteries and delicious haunted tales. Her publishing credits include The Cin Fin-Lathan Mysteries and her Haunted series. Tricia: Hi Alexie. It's wonderful to have you on my site. Can you tell us a little about yourself? Alexie: Oh no, this is a bio question. At home we refer to my biography as a biohazard. I think the best way to start to describe me is that I’m a very quick learner, and because of this as a child I would get bored quickly. I depended on my imagination to keep me entertained while I waited for others to catch up. I married young, eighteen, to my high school sweetheart. We traveled the United States moving more times than I presently have socks that match. This gave me the opportunity to live in various cultures and expand my knowledge with real life experiences. Tricia: Wow, it sounds like you've had an exciting life. When did you begin writing? Alexie: I began writing twenty-eight years ago with my first novel, a science fiction post-apocalyptic survival story called Harvest Eve. After that I experimented with writing a children’s book and poetry. I didn’t start writing mysteries until the late 1990s when I simply ran out of books I wanted to read. Tricia: You’ve written and published several novels. Which novel did you publish first? Can you tell us about it? Alexie: I had been trying to attract a publisher with my cozy mysteries since the turn of the century. Publishing was changing even then. You needed an agent to get a publisher to read you. This is really a shame as more and more agents were directing what the public would read instead of people who loved the craft of a well-written story. I was frustrated. I was discussing my dilemma (okay I was whining) while taking a walk with my son. He suggested I write something different. This was how The Hauntings of Cold Creek Hollow came to be. It is a very unusual ghost story. I released it at the beginning of 2012 and it took off. It sold more copies than all three of my cozy mysteries that I released a month later. I’ve since written two sequels and two novellas in my Haunted series. This year I have published eight e-books and one box set. Tricia: Eight books? That's fantastic! Can you tell us about your most recent release? Alexie: Homecoming PEEPs 3.2 is a character-driven personal haunt story. It is the second novella that I wrote to fall in between my last novel Sand Trap and the work in progress Darker than Dark. I’ve always liked the idea of giving the reader a greater insight into my characters by telling them a single haunt story. This novella deals with the face of my paranormal investigator group, Mike. He has been haunted since he was a child. The first encounter happened when he was staying in his mother’s childhood home in Lund, Illinois. To his horror, his mother insists on going back there to ready the estate home for a sale. She insists on hiring a few of the team members of the Paranormal Entity Exposure Partners (PEEPs) to help her and her son in this project. They not only have to deal with cleaning out the house of furniture but a couple of ghosts too. 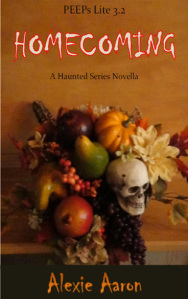 Tricia: I love books with a paranormal theme, especially this time of year. How do you get the ideas for your novels? Alexie: The Haunted series comes in part from personal experiences, lore and my engineering mind. Yes, I believe there are paranormal things, I’ve seen them. We had a platform rocker (I understand I’m inheriting it, yikers) that rocked by itself. I heard the low creak before I saw it start to move. I used this in Ghostly Attachments. The Cin Fin-Lathan Mystery series comes from my personal experiences as a concert musician and band librarian. Also I spend a lot of time in the UK. It was great to start the series there. Alexie: I am inspired by people, watching them, listening to them. I am a lover of dialogue. I love banter. Katherine Hepburn and Spencer Tracy, Cary Grant and every actress he worked with brought so much to film with their timing. Bravo to those brave few who wrote for them. Tricia: Of all your novels, which was the most challenging to write? Alexie: The Hauntings of Cold Creek Hollow. This was my first third person novel. Before that I wrote in first person. It took me a while to be able to change point of view smoothly. Also, this was something extraordinary for me to take on. A ghost story from the haunted, the hauntee and the haunter’s perspective. I remembered that I sat still, closed my eyes and envisioned petite Mia Cooper leaning against her oversized pickup truck parked on the side of the road waiting for this amateur group of investigators who she knew were going to make her life hell. Next a cop car pulls up and Whit says, “Whatcha doing?” She says, “Manning a speed trap.” I was in love. These new characters walked into my head and have been talking nonstop since. Tricia: Of all your characters in your novels, who is your favorite and why? Alexie: Mia Cooper. She is a social misfit gifted with the abilities of a sensitive and bilocation. Her best friend is a ghost named Murphy. I like her because when she is insulted she pushes it away and doesn’t let it affect the job she is doing. Mia is brave, confident in her abilities and headstrong. She is vulnerable, falls in love too easily and swears like a Marine. She is complex, surprising and fun to write. Tricia: Describe your writing process. Do you plot everything first, or do you write by the seat of your pants? Alexie: I’m sure someone reading this would like me to say outline, but I would be a fibber. I sit back, close my eyes and connect with my imagination and type the keys off the keyboard. I have replaced the E, S and M several times. I write the whole story. Then I go back and edit the first draft. After that, a copy editor gets it. If I have trouble starting a manuscript I start with a scene. I may not even use the scene, but it wakes my characters up and gets them talking. Tricia: I think you have a great method for writing. What projects are you currently working on? Alexie: I’m 15,000 words into the fourth novel of the Haunted series. It’s called Darker than Dark. It deals with something I had seen when I lived in Florida. I’m hoping to translate what we dealt with, amp it up and scare the pants off of my readers. Tricia: What advice do you have for new or aspiring authors? Alexie: Write what you know and get a copy editor. Even if you are good enough to edit the New York Times, you will miss things in your own work. I have two beta readers and still we miss things. Tricia: Where can my readers go to learn more about your work or to purchase one of your books? Alexie: My books presently are in e-book form on Amazon Kindle and Barnes and Noble. Come see me on Facebook, I’m pretty friendly. Very interesting. I have read all of this author's books and they are all fantastic. She has a real knack of getting you totally immersed in the story and you just can't beat her characters. I have yet to read any of Alexie's books simply because it isn't really a genre I would read, but hey I'm beginning to be converted. It seems I really am missing something so maybe, just maybe after such a fascinating interview, I will make a start and looking forward to it.